Another person involved in the death of Cassandra Harris had their case resolved with no jail time. 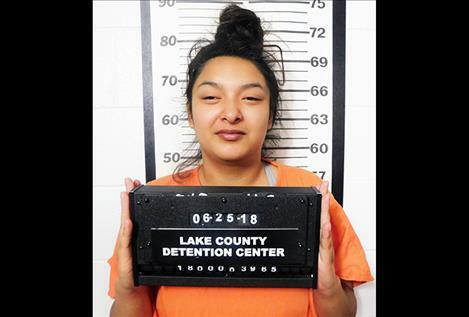 Julia Vaile, 18, of Missoula, was convicted of misdemeanor careless driving during a change of plea hearing at District Court in Polson on March 13. Vaile was initially facing a charge of negligent homicide. Lake County Attorney Steve Eschenbacher later filed a reduced charge of accidents involving another person or deceased person. That charge was later amended to careless driving by way of the plea agreement that calls for six months jail with all that time suspended. Vaile will also have to pay $100 for the cost of prosecution and $250 for the cost of a public defender. Parizeau is alleged to have pushed Harris from a moving vehicle causing her to fall out onto the road with enough force to fracture her skull. There were three others present to witness the event, Donnovan Sherwood, 19, Gale Hendnrickx, 19, and Vaile. Sherwood later pleaded guilty to obstructing justice and was given a three-year deferred sentence based on the condition that he testify against Parizeau had Parizeau taken his case to trial. Charges against Hendrickx were later dismissed. In an unrelated matter, Parizeau is facing trial in April on two counts of assault with a weapon and two counts of intimidation for allegedly pointing an AR-15 assault rifle at two men near Ronan in October 2017. The two men told investigators that Parizeau demanded to see their tribal identification cards, pointed the rifle at them and demanded cash and drugs. This case was initially dismissed when key evidence, a photo on a mobile device allegedly identifying Parizeau as the suspect, couldn’t be produced. The charges were brought back when the evidence was located.